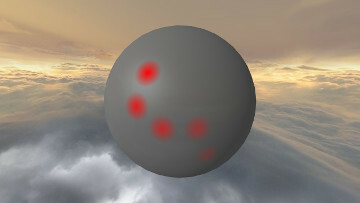 Living Orb is a tangible game console, with which you can easily create your own enlightened games. 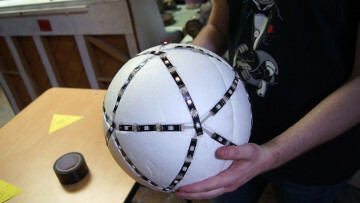 The device is an sphere covered by LEDs. It's like its surface is the screen! And you only control it by rotating it, that's all. This allows for unique games! share your game with others. 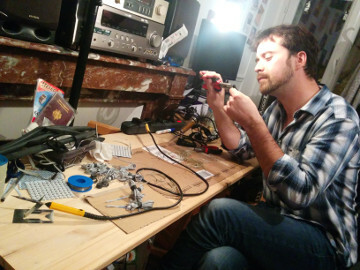 Henri at work, building his own device. The devices includes an accelerometer, a digital compass, and a gyroscope. Therefore it becomes aware of its rotation. 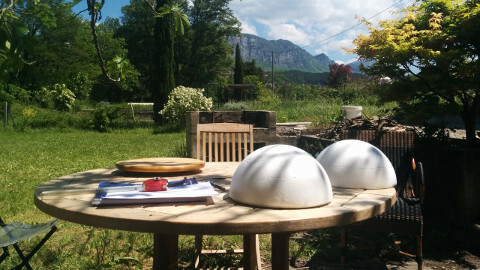 Its structure can be a polystyrene sphere,it can also be 3D-printed, or assembled with laser-cut boards. Working on the hardware in the best conditions. On the wiki, you'll find a multitude of designs already tested, the equipments needed for the fabrication, and a lot of advices to support you. So that you enjoy making it! 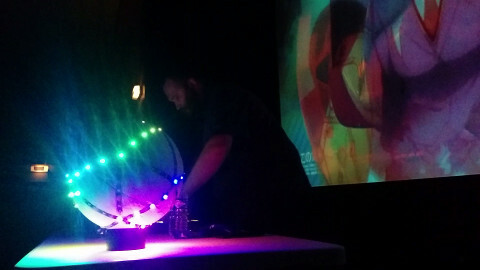 First prototype at Ludipunk Fest (Montreuil, France, on May 21, 2016). The device, both a controller and a scren at the same time, invites you to create unique games. Since it's a tangible object, there are new game mechanics to discover. Decorating the live act of Square Tune Magician at the VIP demoparty (Thoissey, France, on June 11, 2016). The lights are so beautiful to see, that the Living Orb can even serve as decoration, with no interactions. With the web editor, write code directly on the device. 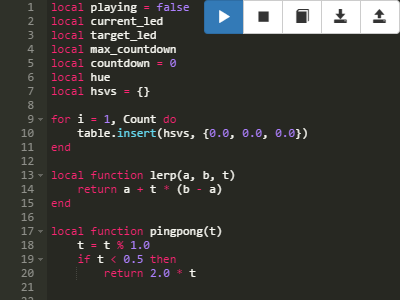 It's very easy to program games using Lua! -- Initialize the random generator. -- Pick a random LED. Test games in the simulator. There is also a simulator to test the games in your browser. This will boost your creation process. Living orb becomes what you decide to do with. Feel free to customize it as you wish. You can then share your creation to the community! Share also your games. On the game repository, creators exchange their games and collect new ideas. Subscribe to the newsletter to show your support and to get project updates. You will typically receive a mail every few weeks. Your email address won't be used for any other purpose. Project by Jonathan Giroux and other contributors. Find all ressources on GitHub.